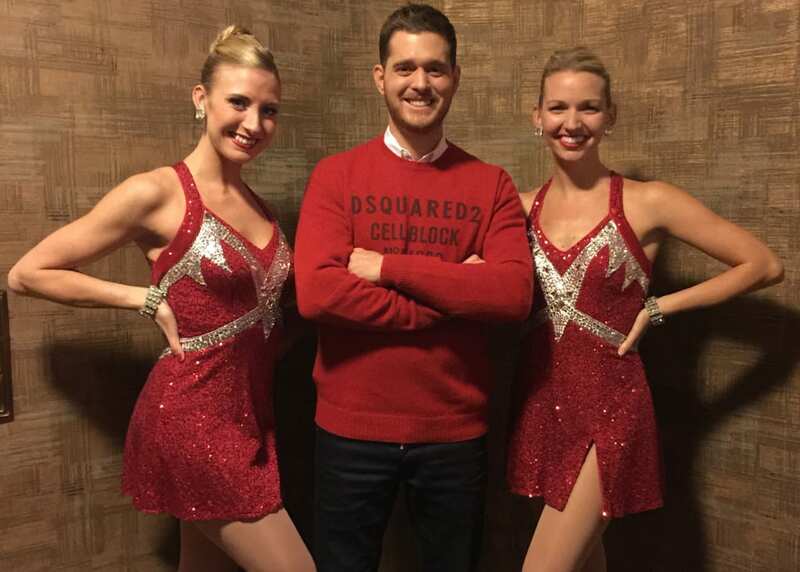 ichael Bublé is almost as synonymous with Christmas as the Rockettes! So it’s only natural that we were asked to join Michael on the Great Stage at Radio City Music Hall for his 4th Annual Christmas Special on NBC (2014). A night full of music, comedy and Christmas cheer, the star-studded guest list included female icons like Barbara Streisand, Ariana Grande and the ultimate diva, Miss Piggy. Not only did my Rockette sisters and I get to perform an excerpt from “New York at Christmas” and open the show for Michael, but I was extremely lucky to be a part of a photo shoot with the talented, endearing and multi-Grammy Award-winning artist. As a Rockette, I’ve had the privilege of meeting some pretty amazing celebrities along the way, but Michael was hands down the most down-to-earth celeb I have ever met (it’s as if I was talking to my brother!). We chit-chatted about his days in live theater and on the Broadway stage as if he were just a fellow performer. Needless to say, this day went down in the books. Christina has been a Rockette since 2005. She currently resides in New York, NY.